I have used Netflix, Blockbuster Online, Greencine, and Nicheflix for online DVD rentals. The best is Netflix. They are the most dependable: fastest turnaround, largest selection, and best Web site. They have the best blogger-fans, too :). The Netflix blog is written by the excellent James Rocchi. Blockbuster Online would be my second choice, but they always have availability problems. I am testing BBo for comparison. No more than two-thirds of my queue has ever been "available now". I can get mainstream hits from them, but the four art titles in the top slots of my queue have been "long wait" since January. I never know what to expect from them; they never send titles in queue order. The closest distribution center is Charlotte, NC, about 90 miles away, making delivery time about two days or more. Nicheflix is really good for titles that are unavailable on DVD in the United States. They specialize in multi-region discs, which require a special DVD player. Their distribution center is in Indiana, about 500 miles away, so delivery time is three days or more. They don't ship in queue order, because of availability issues. I like their Web site, but anything other than title searching requires using the "advanced search" feature, which is inconvenient. I can't be sure the discs will be in English or have English subtitles, so I have to check the Web site carefully before ordering. Greencine has availability problems. Their only advantage is that they offer out-of-print titles on DVD. Their only distribution center is in California, 3000 miles away, so delivery time is 4 or 5 days. I like their Web site, because in addition to personal recommendations and member lists (like Netflix), they have Movie Primers and Featured Top Lists. They have a cool blog. If you are looking for a title that has been released on VHS, but never on DVD, Facets Multimedia has an online rental option. They also sell and rent VHS tapes, DVDs, and books online. I can't evaluate their online DVD rental service, but their online VHS service is pretty good. They require you to email or call, but I've experienced excellent customer service. Lists of Bests collects all sorts of lists of books, music, and movies in one place. Of course, my interest is mainly in the movie lists. Lists are compiled from award-winners, critics' favorites, publications' favorites, categories, and genres. For example, check out the The Luddite Reader's "Top 12 Most Luddite Films of All Time", or Men's Journal's "The 50 Best Guy Movies Of All Time" or Gerald Peary's 100 Films For Film Literacy. I, the Netflix Fan, have reduced my Netflix plan from 8-out to 3-out. At the 13th annual Networking Symposium, "Netflix founder Reed Hastings made an urgent plea to corporations to provide the consumer with the freedom of choice when it comes to content. "There is an epic struggle between the forces of control and the forces of freedom," Hastings said. "The Web is the bastion of freedom." Hastings' wariness of technologies that would limit audio and video content to a specific provider was a common concern of conference attendees." According to Ted Sarandos, Netflix's chief content buyer, Netflix acquires about 100 titles per year and distributes another 8500 titles. Last September, I reported on a German-language Netflix imitator using the domain name of Netflix.at. That same domain name still works, but it redirects you to http://dvd-club.ch/. They are partnered with Amazon.de. I guess Netflix doesn't want to waste their money on trademark-infringing or cyber-squatting lawsuits. Otherwise, they might feel the need to pick on some folks I know ;). Raven at A Netflix Odyssey has returned from hiatus long enough to report that "Lately, all of my returns are taking just one day. Deliveries to me are still two days, but returns have sped up." He receives discs from the Kansas City distribution center and returns them to Oklahoma. Garrick Van Buren, of Workingpathways.com, believes Netflix could increase subscriptions by automatically sending people recommended discs, in addition to just what's in your queue. What do you think of this idea? 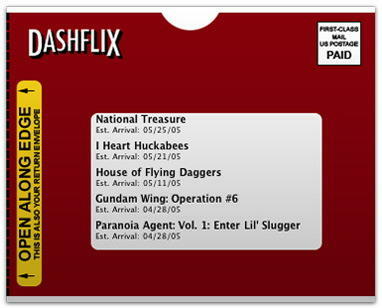 Apple Computer is distributing Dashflix, which is a Dashboard Widget for Mac OS X 10.4 or later, which displays your Netflix queue on your Mac's desktop. I think it's cute. Good buddy and Netflix fan matthom has reminded me that this is the Memorial Day holiday weekend, which means Netflix distribution centers will be closed Monday (ack!). It will be a long weekend if you don't have enough titles at home. Tuesday will be a busy day for Netflix! It's a good thing I have five already at home :). Read Matthom's advice. I am blessed by having faithful readers who are also fans of Netflix, who send me good stuff. Badsegue has created a Netflix Queue Manager bookmarklet, which adds these functions to the Netflix Web page: Move to top, Move to bottom, Drag and drop, Sort - by star rating, Shuffle, Reverse. Check it out. I was surfing Amazon.com today, where I learned a new word. It's "Lovemarks ". Lovemarks are trademark brand names that evoke an emotional response. Netflix(tm) is an example of one such "lovemark", because it inspires such crazy, passionate loyalty and love from its customers. Software Publisher's Description: Meedio Essentials turns your existing PC into a fully customizable digital media center that you command using your TV and remote control. Start with the installation wizard to organize and enjoy your photos, music, movies, and weather information. Or use the advanced configuration tools to personalize the look, feel, and behavior of the entire system. Includes access to over 200 themes and plug-ins for exciting extensions such as home automation, Netflix, Skype, instant messaging, movie show times, trailers, and games. Get it at Download.com. Free to try; $49.95 to buy. Go to Movie Recomendations on Yahoo! Movies, sign in with your free Yahoo ID, answer a few questions about yourself and rate movies you've seen, and they will recommend other movies you might like. They do recommendations for new movies in theaters,and movies on DVD/video and TV. 'Absolutely not,' I replied through clenched teeth." BradleyJames says, "I received "The Order" via Netflix this week. I like strange religious films and thought I'd give it a shot. Well it was odd. It wasn't horrible but not sure I'd say good either. I read an article a while back in Creative Screenwriting that talked about it and the initial title was "The Sin Eater". I like that title much better. If you're going to go freaky go all the way. Anyway this is how the DVD came to me. It looked like they made this in some freeware program that came with a CD burner in 1998. It looks very cheap. I'm curious if this is just the Netflix version or if Fox decided it was a lost cause." As Genista says, "Blockbuster is desperately changing pricing, policies and spelling to cope with Netflix's onslaught." BoB reports there's a new Netflix distribution center in Panama City, Florida. If you know the code for this location, please send it to webmaster at listology.com. According to Netflix Chief Content Officer Ted Sarandos, Robbins' film is the kind they seek out: quality movies that are "marketing challenged" and often fall through the cracks in mainstream Hollywood. Controversy is less of a hurdle for Netflix, he says, because there's plenty of room for a diversity of voices in their 40,000-title library. "Consolidation of media outlets results in more homogenized offerings," Sarandos said. "And the square footage and limited shelf space of mainline retailers is so valuable that they're managed closely — stocked with mass-appeal product that squeezes out films like Tim's. We're not espousing a political position but providing a platform." "The audience for small films is there — but fragmented," Sarandos said. "Because we have a national footprint, we can service every community in the U.S…. We're beloved by customers for bringing movies to people who can't afford to go to the Sundance Film Festival — as well as by filmmakers for giving a voice to those on the fringe." 299--Number of movies I've rented from Netflix since I joined in January 2004. 0--Number of movies labeled "Very Long Wait"
0--Number of movies labeled "Long Wait"
7--Number of movies labeled "Short Wait"
39--Number of movies I've rented from Blockbuster since I joined in January 2005. 5--Number of movies "Coming Soon"
8--Number of movies labeled "Long Wait"
8--Number of movies labeled "Short Wait"
17--Number of movies labeled "Available Now"
Leia gets an interesting sample of local favorites from Netflix. Hacking Netflix lives up to its name with the discovery of some linkage to XML code analysis, for those handy little popups that you get when you mouse over a movie title on Netflix. It's called Ajax, and Kellan Flickred it. Of course, some object to the name Ajax. Via Reuters.com: "NEW YORK, May 18 - Blockbuster Inc. (BBI.N: Quote, Profile, Research) on Wednesday said it has begun advertising a test fee of $18 for unlimited monthly DVD rentals, potentially reversing an earlier attempt to undercut rival Netflix Inc. (NFLX.O: Quote, Profile, Research) on price. The test started on Monday and does not necessarily mean the top U.S. movie rental chain plans to adopt the new price, Blockbuster spokeswoman Jeri Anne Thomas said. 'We are a retail company, we test a lot of things,' Thomas said. 'We are testing $17.99, that is one of several tests.'" She sounds a little too defensive, doesn't she? Hacking Netflix is reporting an LA Times story that this means Netflix has taken over the Walmart online DVD rental business. In a reciprocal arrangement, Netflix is promoting Walmart for DVD sales. This isn't such a big deal for Netflix, since Walmart's DVD rental business had very few customers, in comparison, but it could help increase Netflix's visibility and credibility with Walmart customers, of which there are a few. No one predicted this, but I suspect Mike was tipped off :). Netflix Freak is a full-featured Mac OS X application for managing your rental queue that enhances the Netflix experience. The program offers many unique features not available on the Netflix website: (1) Rearrange your queue using drag-n-drop or copy-n-paste, (2) Intelligently shuffle your rental queue while keeping movie series in order, (3) Push movies to the top or bottom of your queue in one action, (4) One-click adding of movies to the top or bottom of your queue, (5) Select all DVDs that belong to a series for easy rearrangement or deletion, (6) Add notes to individual movies, (7) Unlimited undo of queue rearrangements, (8) Search all of your queues by movie title, (9) Create and assign custom categories to movies in your queue, (10) Create and assign renter names to movies in your queue, (11) Easily look up movies on Google Movies, Rotten Tomatoes, IMDb, and Amazon, (12) Switch between profiles without needing to re-enter your password. Version 2.1 supports cut, copy, and paste movies from one Netflix profile to another; switching between profiles without requiring password entry. Netflixter is an application that allows you to manage your Netflix account faster and easier than the website interface. Drag and drop sorting. Recommend movies to friends. See your ratings, average ratings, and average friend ratings. Read reviews and information from IMDB. Sort your movies by Title, Star Rating, MPAA rating, Genre and Availablility. Import your entire rental history from day 1. Analyze your rental history. CD WOW! is a British CD, DVD, and games retailer and renter who advertises their prices in British currency, but offers "free delivery worldwide". They sell Region 2 and Multi-Region DVD formats. Of course, the rental service is available only in the United Kingdom. I knew I was being throttled, so I wrote an application that takes the emailed "Netflix Rental History" and produces lots of charts and graphs on just about everything I could think of.It proved that I was being throttled and gave me the numbers to back it up. The power of this application is that it uses just the information provided by Netflix to create a comprehensive picture of your rental experience. suggestions on how to make this application better. I don't believe in "throttling", but I like looking at my stats. It works for me. Unfortunately for me this trip down the long tail didn't turn out so good." Read more from I Don't Watch Movies... blog. According to Joanne Ostrow at DenverPost.com. She says, "Thank goodness for all those stockpiled tapes, TiVo downloads and DVD rentals: It will be a long summer with no fresh episodes of favorite network dramas until September - and loads of tacky unscripted fare filling the gaps." Read more about why it will be a dull Summer for TV. "Netflix, the online DVD rental service, has said that 40 percent to 50 percent of its rentals can be traced back to its recommendation system. Netflix's system uses a program called CineMatch, which relies upon having members rate movies on a five-star scale and then offers suggestions based on the similar ratings of others. But Mike Kaltschnee, of Danbury, Conn., who runs a blog dedicated to Netflix and other online rental services, began noticing problems: The system couldn't differentiate between the independent films he likes and the Barney movies his two young daughters prefer, resulting in a mishmash of suggestions no one wanted. So Netflix configured the system to accommodate individual profiles. There's still a catch, though: You have to rate your rentals for the system to work. 'What you put into it is what you get out,' said Kaltschnee, 40, who prefers Netflix's system to those offered by other online rental services." Read more about how other companies make recommendations. New Jersey public libraries are having to rent DVDs to keep up with public demand, as evidenced by the growth of Netflix. They charge $1 for a week-long rental. "GreenCine, the preeminent Video-on-Demand and DVD Rent-by-Mail company with an unsurpassed collection of independent, international and classic films, announced today the availability of a new 1-Out plan for its members, at the rate of $9.95 per month." Greencine has only one distribution center, on the West Coast, and carries an inventory that is an overlapping subset of Netflix's. Jennifer Netherby, writing for Video Business Online, was at the Piper Jaffrey Seventh Annual Technology Conference, where she heard CFO Barry McCarthy say that "Netflix would deliver downloaded movies to TV sets through devices that connect to the TV and Internet and have Wi-Fi capability." McCarthy also said that "Netflix, meanwhile, is considering selling advertising space on its DVD mailers, Web site and through targeted e-mails, which also could improve profitability. Business writer Betty Lin-Fisher of the Akron, Ohio Beacon Journal changes her recommendation. In February, she recommended Blockbuster Online, because of its lower price, but now it's Netflix, because of their better customer service. Among other notable details from this article, Shane Evangelist, Blockbuster Online spokesperson said, "88 percent of Blockbuster Online's customers are satisfied." Is that something to be proud of? If you are new to Netflix, and need help filling your queue, start by looking at their award-winning movies lists. If you have seen any of those movies, rate them. Rate all the movies you have ever seen. Keep in mind that, for movies you rate a 3 or above, Netflix will recommend more that are similar to those. List of movies that have been considered among the greatest ever. MikeK at Hacking NetFlix says "Aaron and Garrett are reporting that there is a new Netflix shipping center in Salt Lake City. This should make a few people in that beautiful part of the country happy." Netflix fan matthom contacted Netflix customer service today, because a disk they shipped yesterday was returned today, without him ever receiving it. Read more. Pt posts a photo on Flickr with the comment, "weird, did anyone notice that netflix is putting their brand on the menus and physical dvds?" Perhaps it's because Netflix has a special distribution deal which allows them to have the film early. You can rent it there now. Whereas, Amazon.com has the same movie, Game Over: Kasparov and the Machine , with a release date of May 31, 2005. Another possibility is that it's a leftover from the Independent Spirit Awards. Brian McConnell has written An Open Letter To Netflix in which he details the obstacles to Video On Demand, and how Netflix (via Tivo) could provide Video Almost On Demand right away. Jer at nyquil.org has just joined what I've decided to call the "500 club" of Netflix members who have 500 titles in their queue--which is the maximum you can have. I was in the 500 club last year, but I promised myself not to add any more to my queue until I finish 1001 Movies You Must See Before You Die . I'm down to 359 now. (Of course, I cheat every now and then). The Media Stock Blog reflects on the possibility of a postage rate increase and its affect on DVD rental by mail. A postage rate increase impacts Netflix (NFLX) and Blockbuster (BBI), but which would it hurt more? The United States Postal Service is requesting a two cent increase in the price of first class postage, from $0.37 to $0.39. If approved, this increase would negatively impact both Netflix (ticker: NFLX) and Blockbuster (ticker: BBI). But which one would it hurt more? The Media Stock Blog provides "News and analysis of Media and entertainment stocks. No buy or sell recommendations. Provided by Seeking Alpha for professional investors." Has links and stories about investor resources, movie/box office data, fan sites, media companies, studios and distributors, theatre chains, broadcasters, etc. The only time they made the list was in 2001. The Clio awards are for excellence in advertising. Peerflix introduces “My Friends”, an exciting new set of features to make it easy for you to trade your DVDs with those close to you. “My Friends” creates a personal environment where you can freely and easily share your personal DVD library with your friends and family. Read on to find out more about this cool function and how you can earn free Peerbux just by using it. Peerflix is a Netflix alternative which enables its members to network and trade DVDs person-to-person from their individual inventory. The USPS on Shoreline in Alameda, CA, has designated one of their blue boxes as "Netflix Only". As the comment says, "You know you've hit it big when you have a post box just for people to mail stuff to you. Not even Santa Claus gets his own box!" **Correction, I discovered today (May 17), that Blazenhoff deserves credit for finding it first (uploaded May 5). Apologies to the Breeder. John Resig has written a Perl module designed to pull down every movie that you’ve rated within your Netflix account. Utilizes the wonderful WWW::Mechanize module to work its magic. Although I am very happy to answer any of your questions about the Netflix service, I am not an official representative of Netflix, so I cannot fix any issues you may have with them. I year ago, I blogged about someone trying to cancel their Netflix subscription by commenting on this No Assembly Required blog entry. Click here for the proper way to contact their customer service department. If you really want to cancel Netflix, click here. If you're going to use the Internet, be sure you know how to identify which Web site you're reading. Apparently, a Netflix subscriber did a search for Netflix Customer Service and stumbled across this entry on the Tinotopia blog. He apparently mistook the blog for Netflix, and left a comment, including his phone number, email address, and full name . Perhaps by now he has had to change them all, eh? The post has been up for two years. India-born Debdoot Das was just filming his salsa class one day, when his friends asked if they could buy a copy. Made on a Mac with Final Cut Pro and DVD Studio Pro, the Quick and Dirty Guide to Salsa has been the highest-selling dance video on Amazon.com, leading to distribution deals with Navarre and NetFlix. “I became my own label based on the success of one video,” marvels Das. “And that guarantees entry in the brick-and-mortar stores.” Now, two more videos — featuring intermediate and advanced salsa lessons — are in the works. Rent it from Netflix here. The Yahoo! Groups : netflix_operations_discuss has some new photos of the insides of the Netflix distribution centers, showing staff processing and labeling discs by hand, and row after row of boxes of discs in their little white sleeves. The smiling fellow, looking straight at the camera, is Netflix CEO Reed Hastings. Membership required. Humax USA Advances DVD Recorder Category with Introduction of New 40-Hour DVD Recorder with TiVo(R) Service The Lowest Priced DVD Recorder with TiVo service ever to hit the Marketplace at $399. As if Netflix isn't enough. Schools Digest Workshop focuses on kids with special needs May 1, 2005: "Reed Hastings, CEO of Netflix and a former State Board of Education member, will be honored with the first annual Pacific Collegiate School Heritage Award. Hastings, one of the founders of Pacific Collegiate, served as the first board president and helped get the college prep charter school off the ground." Via the LA Times: "movie rental company Netflix, reported Monday that he gave $200,000 to support the proposal to redraw legislative boundaries, an idea opposed by Democrats, who control the Legislature, and by many Republican legislators. Hastings said in an e-mail that he gave the money in hopes that the measure would open the way for the election of more moderate legislators. Schwarzenegger nominated Hastings, a Democrat, to the state Board of Education, but the Senate rejected his nomination earlier this year. Hastings said the rejection had nothing to do with his decision to donate the $200,000." Hacking Netflix readers Sarah and Seth tipped [Mike] off to a new Netflix Shipping Center in Des Moines, Iowa. The winners of the Webby Awards were announced online on May 3, 2005, although the 9th Annual Webby Awards gala event will be held at legendary Gotham Hall in New York City on June 6, 2005. Netflix was nominated for a Webby award in the eCommerce category for 2004. I was hoping they would get some recognition this year, for all their success. Other nominees in that category last year were eBay and Martha Stewart Living. The winner was iTunes. Here's the list of winners in the many other categories. J. Stout has designed a plugin to enable your Squeezebox to display your Netflix queue. He is a runnerup in the Squeezebox Plugins Contest by Slim Devices. The Squeezebox2 is a wireless network music player. "the GreenCine Daily blog (daily.greencine.com) draws about 80,000 visitors each month with its dispatches from film festivals around the world. Woo credits the blog with helping double his company's sales in 2004. 'When we started off, I was skeptical about whether it would be successful, but it is core to our strategy,' he said. " The Dragon*Con Independent Short Film Festival is taking submissions until June 15, 2005. By "short", they mean less than 60 minutes. They're looking for anything "fantastic", which includes Sci-Fi, Fantasy, and Horror films, any kind of animation, and anything that is not "slice-of-life". The Dragon*Con Independent Film Festival is a four day event on Labor Day weekend in Atlanta, GA. This blogger will be attending. One person I hope to see there is Ted Sarandos, Chief Content Officer for Netflix, or his representative. Guardian Unlimited: "Despite fears that internet piracy would dent its profits, Hollywood has had a buoyant year. Worldwide revenues from cinema tickets, videos and DVD sales, as well as television rights, reached a whopping $44.8bn last year, up 9% from 2003. Time-Warner also had a banner year, and their DVD sales were not hurt by piracy or Netflix. Usman has his NetflixQ on his Netflix Page. Mothers' Day in America is May 8. Haven't had time to catch a delicious bass for your mother? Thinking you've run out of time to have a lovely bouquet delivered to your Mom? She's allergic to flowers? I suggest you ignore that other red envelope, and give her a gift subscription to keep red envelopes coming all year long: Netflix. NetflixQ, which uses Netflix.com's RSS feed and Macromedia Flash to display your Netflix queue (or other Netflix RSS feed) in real time on your website. The NetflixQ qill automatically load your queue, display the items in order, slowly fading from title to title. Users can control the playback with the simple-to-use DVD style controls at the bottom of the NetflixQ. An unobtrusive timer shows how much time remains to view the currently displayed title before it will progress to the next title in the list. Upon reaching the last DVD in the list, NetflixQ will begin with the first DVD and repeat until you leave the page. 1. Download the NetflixQ zip file. 2. Unzip the zip file and upload all files to a folder on your web site. 4. Make sure the folder that contains these files can be written to by parse.php. A file named netflix.txt is created in this folder when the Flash movie is run. Note that multi-DVD sets may not display a DVD image. This is due to the way that Netflix stores its images. If you try this on your Web site, let me know, so I can link to you. 2. hit Command-Shift-Left Arrow to switches to the newly created tab (Command-Shift-Right Arrow would work if there was only a single tab opened). The next time NetNewsWire downloads my feeds, the new DVDs show up in my queue. VIA The Media Stock Blog. Consumer spending in both the brick-and- mortar and online channels reached $2.44 billion, up 3% from the $2.38 billion spent last year. Revenue from traditional a la carte rentals along with on and offline subscriptions were up 0.6% year-over-year, while sales for combined DVD/VHS previously-viewed titles were up an extraordinary 23% from last year. "While the VHS format is certainly on a downward trend, the market is being lifted by consumers' transference to DVDs and migration to online channels," said Brad Hackley, Vice President of Business Development for Home Video Essentials™ at Rentrak. I think this shows that Netflix is making the home video business grow faster. Heather and Alex do a pretty good analysis of the pros and cons of Blockbuster Online versus Netflix. They also do a good rant on Netflix versus Walmart. For more fun, check out their movie reviews. Netflix fan Chris left comment on this blogpost that I thought should be promoted to an official post. He alerted me to the existence of lots of good Greasemonkey scripts for Netflix subscribers who are also Firefox users. I've already blogged about the one that shuffles your queue. There are also scripts that add links to IMDb and the Movie Review Query Engine directly to the Netflix movie page itself. Cool. Since using the one from Bad Segue, I'm really get into using scripts. Netflix Friend Matt has discovered how you can view your Netflix Friends' ENTIRE queues. See a screencap here. Just click on the "see more" link on the bottom right-hand corner of the "Top of (your friend's) Queue" box. Except for the top few slots, my queue is made up exclusively of movie titles from the book 1001 Movies You Must See Before You Die .